The ethos of six-man football reflects the grit and resilience of small-town life on the west Texas plains. It also inspired this church’s vision. Who will reach the small town? Who will take the gospel to those places that were once the center of life in our rural communities? This church of 80 has plans to plant 100 churches, and God is providing in exciting every resource they need. How was your weekend? Three church planting breakthroughs from the south plains of west Texas. What does church planting look like in the small towns of west Texas? Learn about Fifth Street Baptist’s disciple-making mission points. What does authentic and effective discipleship look like in a small town? Small town residents understand living in community – you don’t have to teach that. But they desperately need to experience Christ-centered community. You don’t have to teach community and caring for each other in the small town, you just need to connect it to Gospel purpose. God delights in using small things in big ways. Here is an example from the southern plains of west Texas. How do we let our people truly invest in each other’s lives? Community is bigger than just having Sunday school or small groups. What happens when a church has a lot of history but not a lot of legacy? Years spent in existence as a church do not automatically amount to multiplication influence in the community by the church. Hear the story of one established church leaving a legacy. This church believes that reaching 10 people in 100 small towns is the way that a church of 80 can reach 1000 people each week. Relationships overcome geography when discipleship looks like this. What happens when you really believe that discipleship is for every believer not just the spiritually elite? Claim ownership of your own discipleship first. Stop waiting for someone to disciple you and start being a disciple maker. Effectiveness in the small town means that every man woman and child can realistically hear the gospel and have a chance to respond. Here is one way. A church of 80 attendees has planted five churches in the last 18 months. How is your multiplication strategy working? Smaller is easier to reproduce. There is something to being a simple church in simple places with simple people sharing a simple message. Is your operational vision bigger than just more people in weekly worship? It should be. You can sometimes make people do what you want them to do, but vision ownership like this goes beyond getting what you want to be done. What happens when a church starts the multiplication process as soon as they start meeting. What does it mean to be “born pregnant” as a church? God has not forgotten the small town. He has a plan and a purpose to do big ministry in small places. Get out of the office. You cannot influence people you’re not in contact with. Busyness in the office does not equate to effective ministry. Ministry “along the way” reflects the way of Jesus. Irresponsible vision reflects an indescribable God. Be faithful with what He has given you and leave the results to Him. 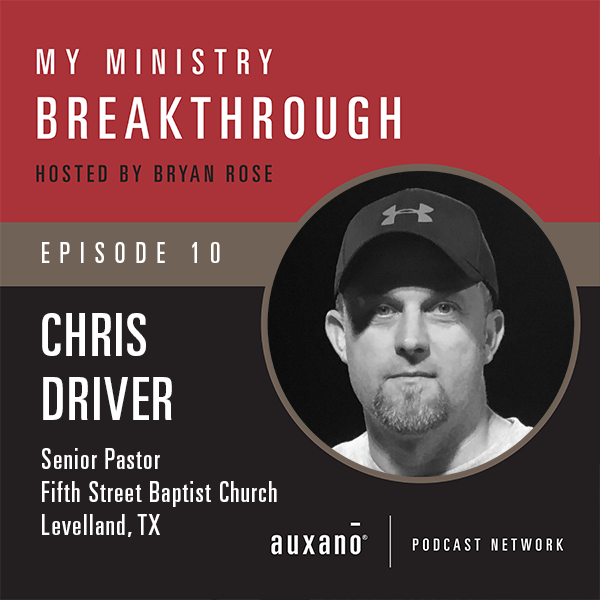 Chris Driver is the Senior Pastor of Fifth Street Baptist Church in Levelland, Texas. Chris enjoys coaching youth sports and is passionate about the sport of six-man football. What if we could get everyone in here out there, instead of trying to get everyone out there in here? How do we equip and deploy people to really love their neighbors every day of the week? It is hard to love your neighbor when you don’t know your neighbor. Don’t just introduce one idea on one Sunday – bringing people back to the idea multiple times demonstrates repeated intentionality. Asking the same questions every week is not repetitive, it is intentional. Until you’re tired of saying it, they have likely not heard it. When the pastor lives the vision first, redemptive movement becomes infectious and vision gets accomplished. Cultivate vision at the highest leadership level among your staff and key volunteers. Learn to celebrate the single step, not just the overall accomplishment. Win every week by giving micro steps for everyone to take. Permission to make the necessary changes to a church requires pointing to the DNA and what is not changing. Executive Pastor Learning: don’t let your pastor get surprised by something you already knew about. Executive Pastor Learning: know what needs to be on your Senior Pastor’s radar and when bad news needs to be delivered. Senior Pastors and Executive Pastors should connect regularly in both organic and structured moments in which you can work through conflicts or divided perspectives. How does the Senior Pastor empower leaders and give them the room to lead? Vision is so critical to the church, that even the church name should be evaluated. When making major changes: go slow, go pray, go read and go deep. Connect stories to vision to declare God’s work among the people. Cascading communication is critical in the success of any major congregational change. Bring people to pray first then bring them to the change. Set up your people to participate in leading the change, not just experiencing the change. Pray and process, but be humble enough to know that you may not have seen everything. What you think about the brand is what you think about the character of the organization. 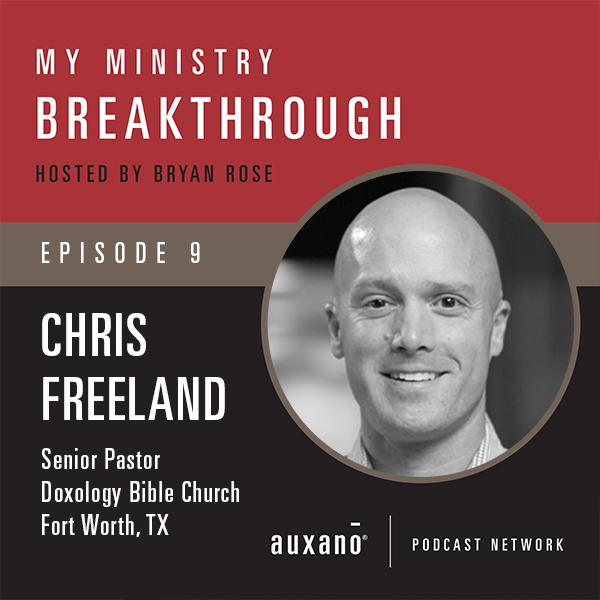 Chris Freeland has been the Lead Pastor at Doxology Bible Church in Fort Worth, TX since 2011. Originally from Columbia, MO, Chris has a music degree from Oklahoma State University and ThM and Doctorate of Ministry degrees from Dallas Theological Seminary. He is married to Kari and they have three young children.